Provider agility demands a high degree of connectivity whether to address episodes of care across the clinical continuum, to facilitate the exchange of claims data, or even to accommodate a rapid acquisition. Meanwhile, the specter of malware has grown to become a significant risk to provider organizations increasing the risk to PHI and business data. As cyber criminals now focus on malware as a means to generate revenue, it will only create an avenue for more attacks in the future. Malware/Ransomware has already plagued several healthcare organizations this year this trend will continue. Additional controls and strategies need to be explored to help prevent this widespread issue both right now and in the future. 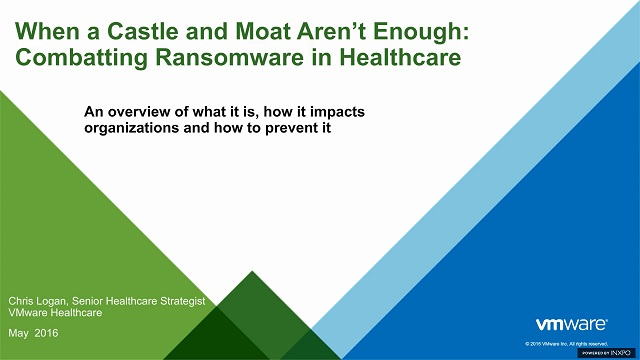 This webcast will allow you to further explore what ransomware is, how it propagates, what can be done to help prevent it and explore some of the solutions VMware ha developed to help minimize the risk related to ransomware.